On October 4, POSTECH and Samsung Electronics signed a cooperative MOU to strengthen the relationship between academia and industry. 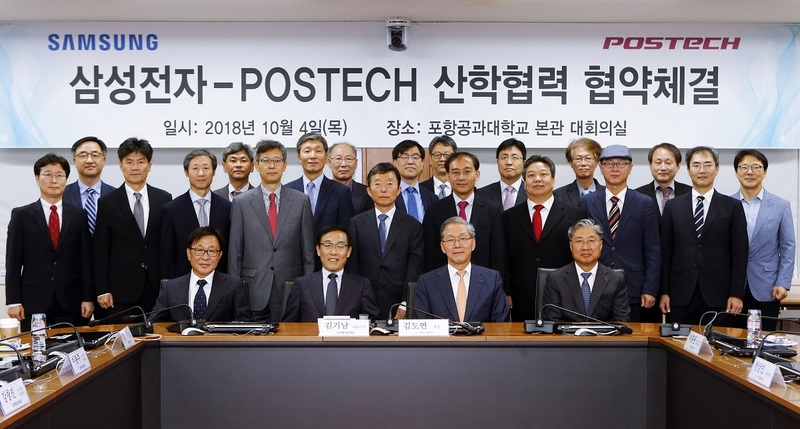 As the leading institutions of their respective fields, POSTECH and Samsung Electronics have agreed to pursue collaborative projects based on each of their core expertise in research and semiconductors. The agreement also laid the foundations for the establishment of the POSTECH – Samsung Electronics Industrial Academic Cooperation Center that will spearhead the procurement of world-class research excellence through close collaboration. Nine departments of POSTECH (Electrical Engineering, Materials Science, Creative IT Engineering, Computer Engineering, Chemical Engineering, Mechanical Engineering, Chemistry, Physics, and Mathematics) will participate in a wide breadth of semiconductor research projects for the Center. The collaborative projects will encompass a spectrum of initiatives in semiconductors including strategic academia-industry projects, fundamental research projects, research support for new and retiring professors, specialized education programs for students, and infrastructure support. Along with the LG Display, Samsung SDI, and Hyosung Corporation centers, the POSTECH – Samsung Electronics Industrial Academic Cooperation Center will be the fourth of its kind for the university.